In this project, we are working to develop a website that focuses on the Dutch colonial world and decolonization process in Indonesia through the pen of Pramoedya Ananta Toer (1925-2006). His “Buru Quartet,” published in the 1980s, was a devastating critique of Dutch colonial mastery of Indonesian society. Our website will publish background materials that will make Toer’s works accessible for students in our western and world history survey courses and also our world literature courses. In case you wish to investigate more closely the events surrounding the 1965 coup in Inodnesia (and the controversial role of the US government), here are some sites that you might wish to check. The National Security archive at George Washington University. 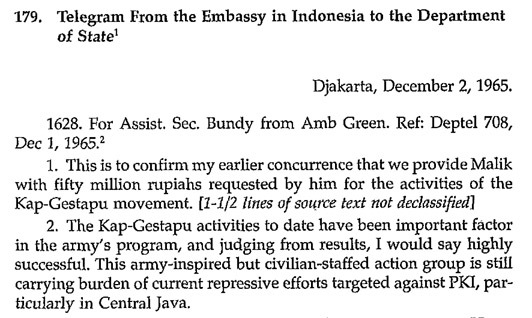 Searching through this site you can find U.S. government documents dealing with Indonesia in the 1960s, focusing on the 1965 coup. Greg Poulgrain, Who Plotted the 1965 Coup? Archive: Tiger Tales (1965, Year of Living Dangerously) supports a 2002 BBC World Service radio documentary on Indonesia, focusing on early Suharto era. I teach history, both online and in person, at Northern Virginia Community College, for a long time now. Professor William Pierce is an adjunct instructor of history at the Loudoun campus of Northern Virginia Community College. He is a retired foreign service officer with considerable experience in Indonesia. © C.T. Evans and W. Pierce, 2011. Powered by Blogger.